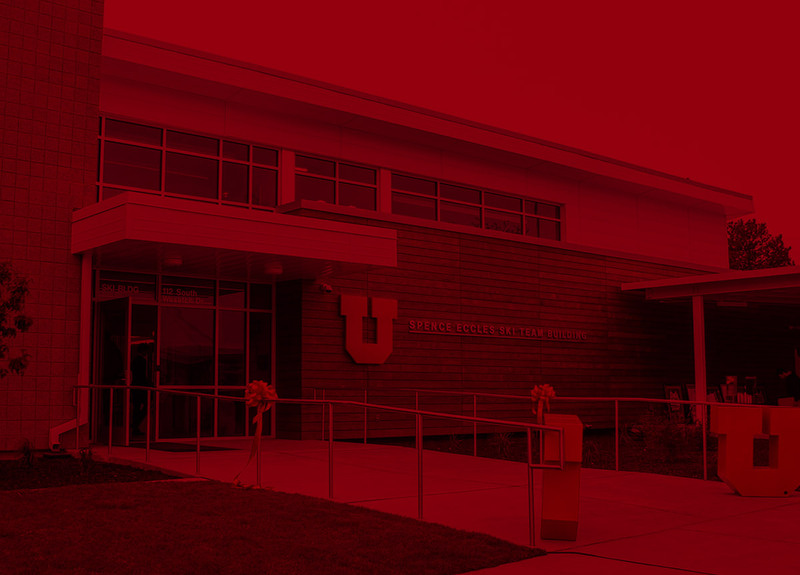 The Utah ski team moved into its brand new 5,931-square-foot Spence Eccles Ski Team Building in April of 2017. The two-story facility is located within walking distance of the Sorenson Legacy Foundation High Performance Center, a 20,000-square-foot facility that houses a strength and conditioning room, athletic training center and other wellness services for several Utah varsity teams, as well as the Burbidge Athletics Academics Center. The ground floor enters into a lobby holding the Alf Engen Sportsmanship Award bowl, a ski-themed chandelier and a commemorative donor plaque. A film study room and lounge for the student-athletes also holds a small office for private study and meetings, as well as plaques commemorating Olympians and All-Americans. Men's and women's custom locker rooms for dry gear storage open into Nordic and alpine team rooms with tuning tables and ski and boot storage for each team. On the second level, a large board room is available for team meetings and also serves as a trophy room, holding Utah's NCAA trophies along with a plaque commemorating individual Ute national champions. The table features a three-dimensional map identifying the ski areas of the Wasatch Mountains. A balcony with views of the mountains and the city is also available for gatherings. The exterior of the building has parking areas for the ski team vehicles, as well as a canopy to keep the vehicles covered. Additional storage is available in the building's basement. "My family and I are thrilled that we could play a part in this fantastic new facility, and I'm humbled to have it bear this Ogden boy's name," said Eccles, who was the lead donor for the building. "This day marks the fulfillment of a dream that began clear back when I competed on the Ute ski team in the 1950s. Now, to have this opening right on the heels of the team's 11th national NCAA championship last month, it just shows you what a tradition of excellence we're building on! This new 'home' for our Ute ski program will be great not only for the team's growing national and international reputation, but also for our ability to continue to recruit and compete at the highest levels." 115 South Wasatch Drive (Use 102 South Wasatch Drive on GPS apps, located between the softball field and track).